Recently I posted articles about two paintings that sold for astronomical amounts of money, one by Klimt and the other by Picasso. I wouldn't have put either painting on my wall, because to me their gravest fault was that they lacked emotion -- the Klimt was merely gaudy, and the Picasso -- well, it was ugly, pointless, and if someone named Pisacco had painted it, it would have been thrown onto the trash heap. 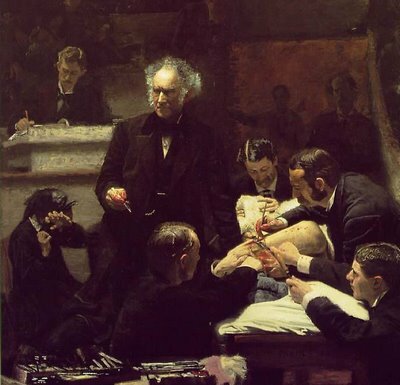 This painting, on the other hand, as well as being masterfully crafted, beautifully lit, and all the elements wonderfully positioned, is full of emotion -- the varying emotions of the professor, the surgeons, the man taking notes, and the frightened, weeping woman in the background, probably the mother of the patient. In 1878 the alumni of Thomas Jefferson University, a medical school in Philadelphia, scraped together $200 so the institution could buy a painting depicting a revered professor, Dr. Samuel D. Gross, performing a gory operation on a man’s thigh. Today that work, “The Gross Clinic,” by Thomas Eakins, is widely acknowledged as one of the greatest canvases of American art. Yesterday the university’s board voted to sell its prized 1875 painting for $68 million to the National Gallery of Art in Washington and the new Crystal Bridges Museum of American Art, founded by the Wal-Mart heiress Alice L. Walton and under construction in Bentonville, Ark. That sum is a record for an artwork created in the United States before World War II. Mindful of potential objections from residents of Philadelphia, Eakins’s lifelong home, the university has given local museums and government institutions 45 days to match the offer. The work is one of the largest (roughly 8 by 6½ feet) and most complex compositions Eakins painted. Depicted holding a scalpel in the vast amphitheater of the Jefferson Medical College, Dr. Gross looks out at his associates, assistants and students, addressing them as he removes a piece of dead bone from the thigh of a patient suffering from osteomyelitis, a common ailment of the time. Alongside him, five doctors attend to the patient, whose bloody thigh is visible to the viewer. Eakins casts a strong light on Dr. Gross’s brow and scalpel. The finely detailed canvas articulates the doctor’s bushy, furrowed brow, bloody hands and silver hair, suggesting his knowledge and hands-on experience. Often compared to Rembrandt’s paintings of anatomy lessons, “The Gross Clinic” was considered revolutionary for its time. Never before in this country, art historians say, had an artist painted an actual operation in progress with medical instruments and blood in full view. But throughout its history, the graphic details have given viewers pause. In 1879, while it was entered in the Centennial Exhibition in Philadelphia, the canvas was rejected by the art committee and relegated to a display of medical instruments and hospital equipment. The other arts suffered too after the introduction of relativism. When will history come to realize most of it is garbage?